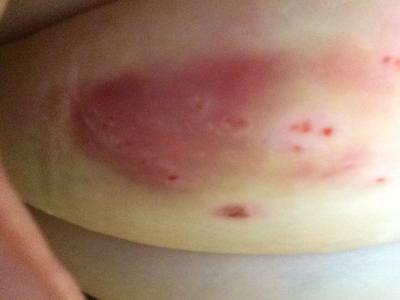 I have been dealing with these skin sores for almost two years now. The skin sores are EVERYWHERE! I first started noticing them on my left hand and my left arm. I went to the emergency room of the hospital because of the sores outbreak and I was told it was infantigo (also know as impetigo) which is a highly contagious skin infection and it was recommended to me that I see a Dermatologist. Well I ended up seeing two of these skin doctors and one said it was infantigo. The other dermatologist that I saw said I was scratching them, this was on my right arm. He ended up putting a Wet Cast on my left arm for about four weeks and said that when he takes the wet cast off, my arm will be clear of these skin sores. Unfortunately, this was NOT the case. I still had all these skin sores on my arm and when I went to check out from the doctor's office, I asked the receptionist when did he want to see me again for my next appointment and she replied that the doctor has released you. So my next step was to see a Rheumatologist. 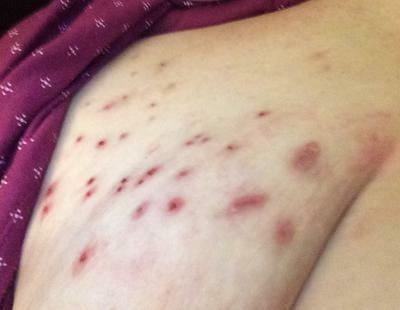 He said that this skin condition that nobody else could diagnose was caused by LUPUS. No blood work was performed or any test in order to reach this diagnosis. My skin problem journey did not end there however. My next step involved being referred to an infectious disease specialist. I saw him and he had me soak me hands in Clorox and water. I followed this treatment advice and had no positive results at all. With this skin problem, I also run fevers. There are blisters under the sores that are filled with blood. Now I have these mushroom white looking clusters forming all over my body. Most of the skin sores are black looking. This skin sores conditions is painful and I hurt from head to toe. Is anyone else experiencing the same medical conditions that I have? Or does anyone know at all what this skin problem could be. Any advice or suggestions are GREATLY APPRECIATED. By the way, I forgot to mention that the skin sores are not itchy. I have included three pictures of these skin sores, which I hope people can use to help me with this diagnosis and treatment. 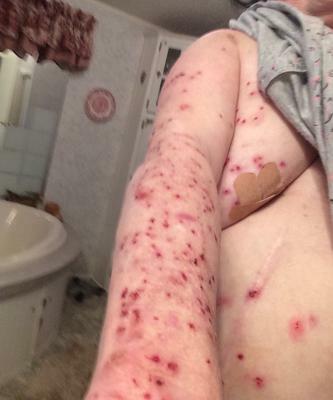 One picture shows the skin sores on my left arm. Another shows the skin problem on my left breast and finally the last photo is of the sores on the bottom of my stomach area. I do not know how long you posted this but my daughter is going on her third year with this. She has been given several antibiotics but none help. Biopsy showed nothing and the dermatologist does not know what it is. Did you find out if you actually had Lupus?